In order to update your CASCON node-locked license hardkey (dongle) you'll first need a new license file from GOEPEL. 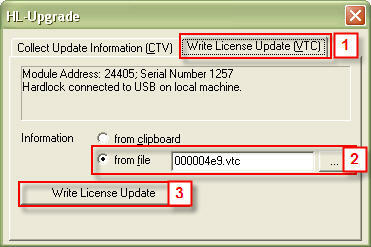 Typically, such license updates will be sent as LCP files (possibly packed in a ZIP or a RAR archive). Once stored on the PC where the CASCON software is installed and with the dongle being connected to that PC, simply double-click the LCP file to install the license. Click the "Write License Update" button.